Oh, hello Monday! How's it going? I didn't think I would see you so soon. The weather has been absolutely beautiful this past week, albeit a little on the unusually foggy side, but still sunny and beautiful nonetheless. So why, Monday, are you not sunny and beautiful today too? Why must you be cloudy and bleh? Why must you live up to your yucky connotations? And of course you must be this way on a day when I feel much better after a week of being utterly ill and bed-ridden (hence the radio silence and disappearance on all social media last week)! Oh well, that's ok. Maybe now I can get some work done and actually get myself caught up - if the weather had been gorgeous my attention span most likely would have been very limited. Anyhoo, aside from the Follow Your Arrow mystery shawl, want to know what else I have on my needles at the moment? A pair of socks for the Socks with Sarah KAL. 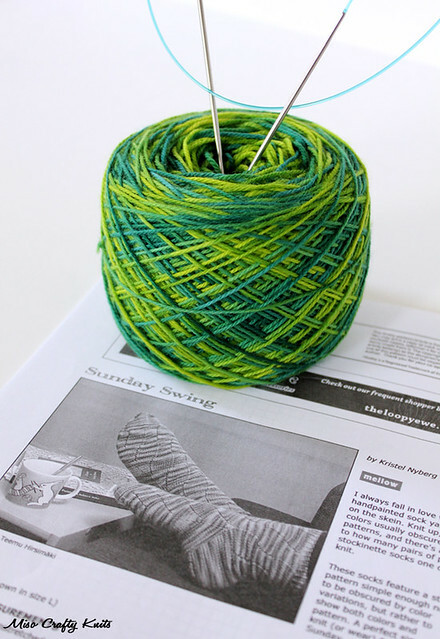 This gorgeous variegated green yarn will be a pair of Sunday Swing socks, a freebie pattern from Knitty that I've had in the queue for over 4 years and only now have decided that I should really knit it up. 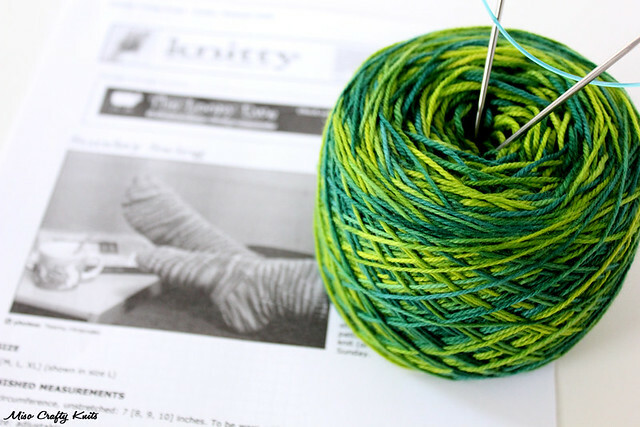 I'm using SweetGeorgia Yarns Tough Love Sock (in the Peashoot colourway) so that I can also use this project for the SGY Stash Dive KAL. You know me, I'm all about the double duties and two-fers! I've had this yarn in the stash for as long as I've had the pattern in my queue so it feels pretty awesome to finally get around to knitting them both up. So far these socks have been quite the easy and relaxing knit. Sorry, there are no actual progress photos due to the aforementioned week of sickness and quite truthfully sock WIPs are usually hard to photograph looking good anyways. Or at least this pattern is. You'll either just have to wait until the pair is finished before you can see them in all their glory, or follow me on Instagram to catch glimpses of them in the works. Sadly, these socks are a bit boring for blogging material as the pattern has been fairly straight forward. The only things worth noting is the fact that I'm knitting the second sock as a mirror image to the first because I kind of like my socks to be complimentary (and I didn't have to chart the reverse design elements, since someone on Ravelry has already done that! ), and I'm loving how the pattern is affecting the different shades of green in the yarn and making some areas all stripey and lovely. This colourway has definitely become one of my favourites from the SGY lineup. It's just so brilliantly bold and vibrant. Would it be weird to say that I can't wait to turn my leftovers into hexipuffs? Because I think this colourway is going to make a fantastic addition to my Beekeeper's Quilt! There's less than a week left of the month and I'm really hoping to get these finished before February arrives. Luckily I'm a few rounds away from starting the heel flap of the second sock, so the goal of finishing this WIP isn't just a pipe dream and is actually do-able. Nothing that a few episodes of Game of Thrones can't get me through! So...5 days to finish half a sock? Let's do this! I have faith that you can finish that second sock. I can't believe how far you've gotten so quickly. Go Melissa! Thanks Chantel!! :D I just hope I have the energy to make it to the deadline! !